On Tuesday, April 24, we will meet at 12:00 noon at the community center. Food: Jim Conrey will prepare the food; $5.00 per person: ham salad and chicken salad sandwiches; potato soup; potato chips; and brownies. 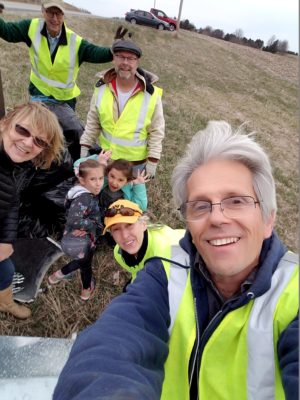 Many thanks to those who participated in Saturday’s highway cleanup: Tommie Petersen, Cliff McFerren, Nathan Yoder (& daughter Alora), Anna & Steve Hanson (& granddaughters Bianca & Yara), and the head honcho Bob Cline. 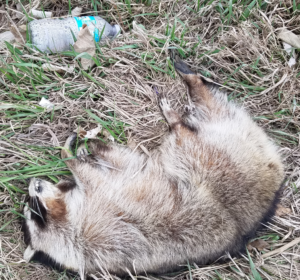 I wonder if the poor raccoon ingested something deadly in that water bottle? Ken Donnelly informed us (via e-mail) that club members have reported that they have sold 997 raffle tickets. Now we need to get the money and ticket stubs turned in to Jodi Kelly or Tom Brooke! 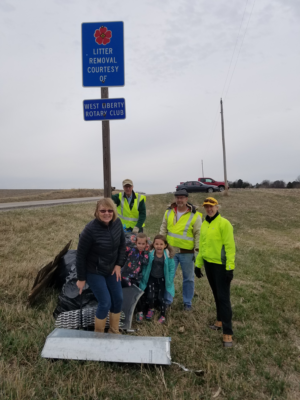 Members were encouraged to participate in Saturday’s highway cleanup. Wayne discussed details of the Family Cookout planned for May 1. See details below. We watched a one-minute video of Conrad receiving the Guardian of Integrity award at the Rotary district conference: https://youtu.be/lISFtE0KgXo. Program: We watched “Don’t Be A Sucker,” a 17-minute video from 1947, produced by the U.S. War Department. The video admonishes Americans that they will lose their country if they let fanaticism and hatred turn them into “suckers.” “Let’s forget about ‘we’ and ‘they’ — let’s think about us!” Here is the link: https://archive.org/details/DontBeaS1947. Conrad Gregg received the Guardian of Integrity award. 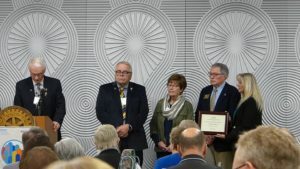 Bill Koellner received the Rotary Foundation’s Citation for Meritorious Service. This is a very prestigious award, given annually to 100 or fewer Rotarians around the globe. Wayne will bring hamburgers and brats; Jim Conrey will bring hotdogs & buns; Tom Brooke will make lemonade. Families are invited to bring a dessert, salad or side dish. The cookout will take place during our regular meeting time (6:00-7:00 p.m.) on Tuesday, May 1 at the community center. All are encouraged to attend and bring family. Please RSVP by sending an e-mail to Steve Hanson (stevehansoniowa@gmail.com) or by calling or texting Anna Hanson (641-799-1303). Iowa City A.M.: 7:00 a.m. every Tuesday @ Kirkwood Room; 515 Kirkwood Ave.
Iowa City: 12:00 every Thursday @ University Athletic Club; 1360 Melrose Ave.
Iowa City: 12:00 every Monday @ MidWestOne Bank; 500 S. Clinton St. Invoices for the 4th quarter dues have been sent out. 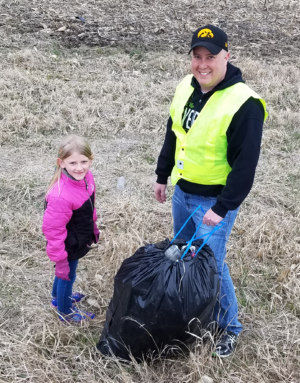 Tom Brooke, Anna Hanson and Steve Hanson will help the WLCSD Athletic Boosters by grilling meat for track meets on April 27 and May 3. We invite others to help between 4:00 and 8:00 p.m.. The need is especially great on May 3, when 26 schools will attend the meet. Please let Anna Hanson know if you are available and willing to help on either of these days (641-799-1303, anna.steve.hanson1@gmail.com).